A huge dollar amount has vanished from corporate America’s investment in capex. Nearly $300 billion in capital expenditures cut by U.S. companies during the recession had not been replaced through May 2015, according to a 15-year study of capex released recently by the Georgia Tech Financial Analysis Lab. 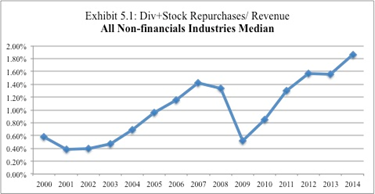 Capital spending for U.S. non-financial firms with revenues of more than $100 million dove “significantly during the recession,” falling to about 3% of revenue in 2009 from 4% in 2008, Charles W. Mulford and Biro Condé, the study’s authors, write. Small as it seems, that single percentage point translates to a huge dollar amount that has vanished from investment in the fixed assets of corporate America, according to the study. And companies’ reluctance to replace the spending on their property, plant, and equipment may be helping to slow the growth of the U.S. economy, according to Mulford. In the period since the recession, companies have only raised capex enough to replenish their existing fixed assets each year, rather than hiking it to levels that would replace the the $300 billion, says Mulford, director of the lab and a Georgia Tech accounting professor. Many companies have been “treading water” in terms of buttressing such things as their buildings and factories and fleets, he notes, and, as a result, “companies weigh less” in terms of heavy assets. Where has all the cash that might have been invested in capex gone? Has it vanished entirely or popped up elsewhere? The findings of the study solidly support the latter conclusion. If corporations had wanted to, they could have saved enough operating cash flow (also known as free cash flow) via capex cutbacks during the recession to replenish capital spending when things got better, according to the study. 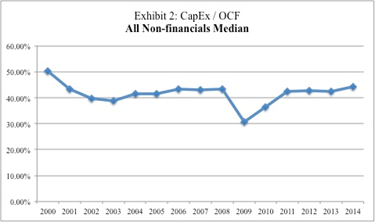 Before the recession, capex made up about 43% of operating cash flow. During the recession, to preserve resources, companies slashed capex as a percentage of operating cash flow to a mere 31% of operating cash flow. 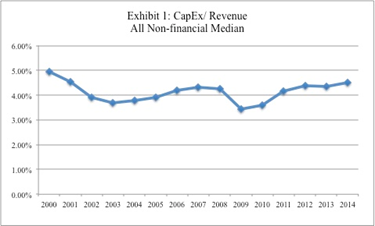 By 2011, however, the ratio of capex to operating cash flow had recovered to 42% of revenue. The authors note that from 2005 to 2008, the four years before the downturn, and from 2011 to 2014, the four years after it, that ratio was quite stable, ranging between 41% and 44%. Many experts have seen the quality of being “asset lite” as a boon to companies, of course, enabling corporations to please investors with their streamlined balance sheets and their purportedly efficient use of capital. On the other hand, companies’ widespread decisions to hoard cash and invest in dividends and share repurchases rather than pump money into their hard assets has helped slow U.S. economic growth, according to Mulford. That caution may derive from a lack of optimism on the part of the C-suite, which in turn may be reacting to government tax and regulatory policies that may slow growth, he adds. Or it may not. Does the tepid investment in capex reflect the ongoing technology and automation boom and a resulting falloff in the need to invest in fixed assets? Mulford wonders.